Posted byPatrick	 April 12, 2019 Leave a comment on More art in more places, please! 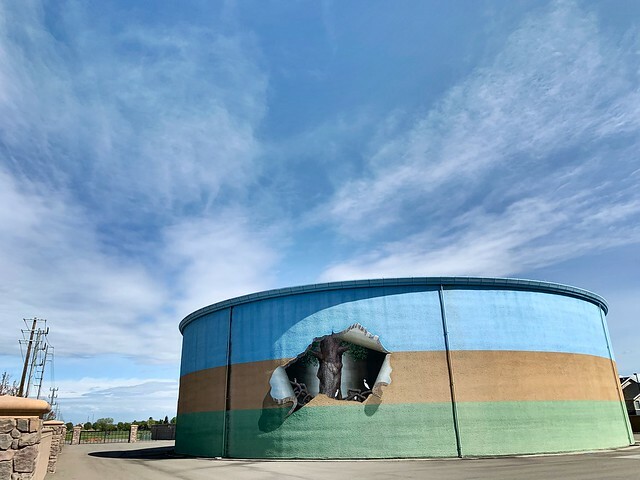 This mural, on a water tank (? ), is a few neighborhoods over from mine, in Sacramento. I remember first seeing it as we were searching for houses to buy, and thinking “how awesome to see art instead of a blah beige industrial tank” and “I would love to live in a place that encourages art like this”. Yesterday, after a long series of conference calls, I grabbed a late lunch and took an afternoon drive. I stopped (quickly) by the side of the road to grab this snapshot, making a note to come back to it sometime when the light was more aligned to showcase the center part of the mural. I also noticed that there is a bike path that runs right past this, making another note to myself to get out to explore that soon.